If your oriental rug is looking worse for wear, you may have faced the dilemma about whether to repair it or replace it. When you are looking at a damaged or worn rug, it might seem like the only real solution is to buy a new one. Most people don’t realize they can save hundreds of dollars, or more, by having it repaired. Oriental rug repair and restoration is a precise job that requires an expert. It can be a labor-intensive process. It is therefore important that you take your rug to a skilled rug repairer who has the experience, and the expertise carry out the repair. Your skilled rug repair master should have expertise on a wide variety of rug styles and fibres. An expert repairer will have techniques to restore both handmade and machine-made rugs. If carried out by an expert, the repairs should be almost invisible or at the very least, hard to notice without close inspection. If your rug shows signs of damage, you should get it looked at sooner rather than later. Rugs can quickly fall into worse repair if the damaged areas are walked on frequently. This could make the cost of the repair higher, as the damage worsens over time. Worse still, damaged and frayed edges could cause a trip hazard. Even if your rugs are undamaged, they can still benefit from a freshen up. The pile of Oriental rugs can flatten over time. If they are in high traffic areas of your home, they can also become dirty or the colours muted. An expert rug repairer can breathe new life into your oriental rug. A professional clean can reinvigorate your rug by removing years of dust and dirt. The cleaning process can also help to lift and revive the pile. Repairing a rug can be far less expensive than buying a replacement. 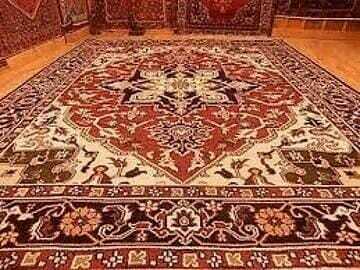 Trust Bebirian Rugs to restore your rug to its original beauty. Bebirian can bring those rugs back to life. For over a century, we have been selling and servicing both domestic and Oriental rugs. Our company was founded in 1912, and to this day is recognized as one of the finest Oriental rug cleaning and restoration facilities in the area.